Top 10 Tradeshow Giveaway Items | Norscot Group, Inc.
Tradeshows are a great way for businesses to enhance their company’s profile while drawing attention to their brand. With numerous opportunities to meet new clients and add prospective leads, grabbing the attention of attendees should be a number one priority. One of the easiest and most effective strategies to do this is through promotional product giveaways. 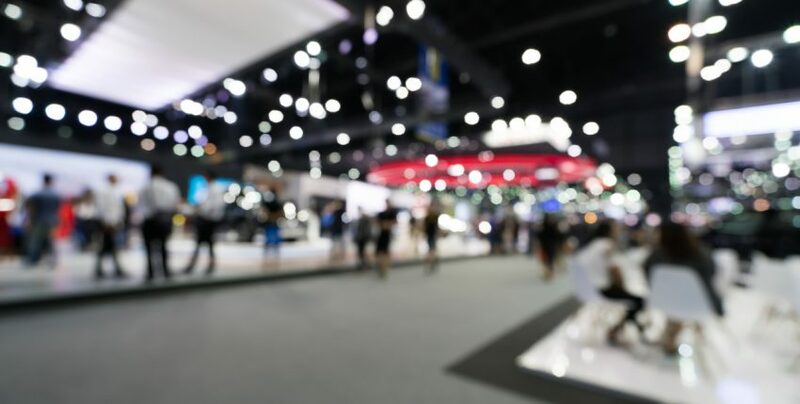 The key is to find the best tradeshow giveaway items that will be used again and again – keeping your company’s brand and logo prevalent in the recipients’ minds. The following are a list of the top ten promotional product giveaways that you may want to consider. From jotting down notes on the tradeshow program to taking down a confirmation number while on the phone with an airline, a pen will always come in handy. And, provided the attendee doesn’t lose it first, this is one promotional item you can be certain will be used again and again. If you’re unsure about which promotional product to go with, a writing utensil is pretty much always a safe bet. Tradeshows are all about networking and sharing information, so it shouldn’t be a surprise that breath mints are a practical lifesaver (sometimes literally!) for attendees as they speak with multiple people throughout the day. Your brand will surely be memorable if you can help save someone from embarrassing bad breath. Even though a professional may be attending a tradeshow, they often need to stay connected at the office. Everything from texting and apps to emails and browsing the web can take a toll on a phone’s battery life – leaving professionals scrambling for an outlet. You can simultaneously supercharge your brand and an attendee’s phone by giving away promotional phone chargers and even have them available to use at your own tradeshow booth. Giving attendees extra power when they need it most will most likely make a huge impression. If you want people to remember your company’s name, be sure to stock your booth with branded hand sanitizer. This cost-effective promotional product is convenient and crucial for networking attendees who are constantly shaking hands. No one wants to return home sick after attending a tradeshow! People love reusable water bottles and bring them along to the office, the gym, and everywhere in between. Giving away promotional water bottles will surely draw a lot of attention to your booth and draw traffic to your trade show display. Many tradeshow professionals frequently travel, but luggage tags aren’t always on hand. For that reason, branded luggage tags are not only beneficial but timely. Plus, once they are attached, they typically stay put for the long haul! Similar to reusable water bottles, earbuds are something that can be used on a daily basis in a variety of ways. Along with branding the earbuds, be sure they come in a branded case, too. Otherwise, the recipient may not remember where they got them! Lip balm is an excellent promotional item because it lasts a long time and the recipient can use it every day regardless of the season. It’s something they are more than likely going to keep with them, which means every time they reach for it in their pocket, they will be reminded of your brand. It’s inevitable that pretty much every company at a tradeshow will be giving away promotional materials. While most of those trinkets won’t make it past the trash can, attendees will surely find your tote extremely useful, especially when traveling. Tote bags typically fall under the category of “premium promotional tools” so keep that in mind when establishing your promotional budget. From branded candy bars and pretzels to water and coffee, attendees will flock to your table when they see you’re offering free food. Walking the floor of a tradeshow can work up an appetite, so appease your visitors by providing branded snacks and allow your sales team an opportunity to pitch them. While the above mentioned promotional materials are some of the most popular ways to grab the attention of tradeshow attendees, it’s important to know that not all promo materials are created equal. And, while some promotional tools may make for great trade show swag such as the very trendy fidget spinner, they may not be effective in other settings. Remember, the best giveaways are not just fun or cool, they should be impactful and practical for your prospects as well as for your brand. When choosing tradeshow promotional products, consider the marketing goal you are trying to achieve. Ask yourself how the product will be distributed and if it fits your marketing strategy and message. Without a plan and a clear understanding of how to integrate the promotional products into your marketing program, you risk wasting valuable advertising dollars that could have otherwise been used more effectively. A good rule of thumb is to suit the product to the person. Meaning, don’t simply select a promotional product you personally would like, choose one you know your audience will like. Be sure that it fits your purpose. Keep the promotional items budget-friendly. While having cool giveaways like tote bags and backpacks will make your brand memorable, the last thing you want is to break the bank doing it. Spending too much of your advertising budget on promotional products for your tradeshow booth can negate their return on investment. So remember to think outside of the box; sometimes the simplest promotional materials are the ones people will use the most. The key to the most successful tradeshow promotional products is to find the sweet spot between attractive, unique, and useful. That said, keep the giveaways inherently valuable. Although some giveaways may seem boring, some of the most effective tools (like a pen) can be far more valuable than a flashlight on the tradeshow floor. It will certainly be used more often! Above all, be sure whichever giveaway you choose that it reflects your brand. Even the coolest promotional product will fall flat if the recipient can’t remember who gave it to them.